Sustainable action is focused on the future-viable development of humankind. This means satisfying the requirements of the present without living at the expense of future generations. The most diverse fields can promote sustainability. These primarily include protection of the environment but also education, social commitment and commercially responsible action. 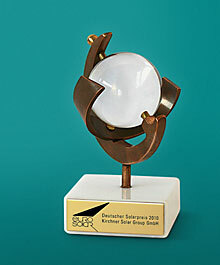 Kirchner Solar Group gives high priority to thoughts on sustainability. Our products and services are also intended to promote an environmentally friendly revolution in favour of renewable energies. In addition to its business operation in the field of project planning and implementation of photovoltaic installations, Kirchner Solar Group has for years supported education on sustainable development and about the environment. Collaboration with the Licherode Environmental Education Centre (Ökologisches Schullandheim & Tagungshaus Licherode e. V.), which provides information and further educates children, teenagers and adults about the field of ecology. Licherode Environmental Education Centre has won several awards for its outstanding work, for example as a „UNESCO project for education for sustainable development“.